So, I haven’t blogged in a while and I apologize. Yesterday I was preparing my article for the Herald and getting my life back in order after being on vacation. I was also doing some meal planning a prep for the next few days of what looks like a busy work/life week. One of the things I made yesterday was a pasta sauce that I could take to work with me for the next three lunches and heat up over pasta. 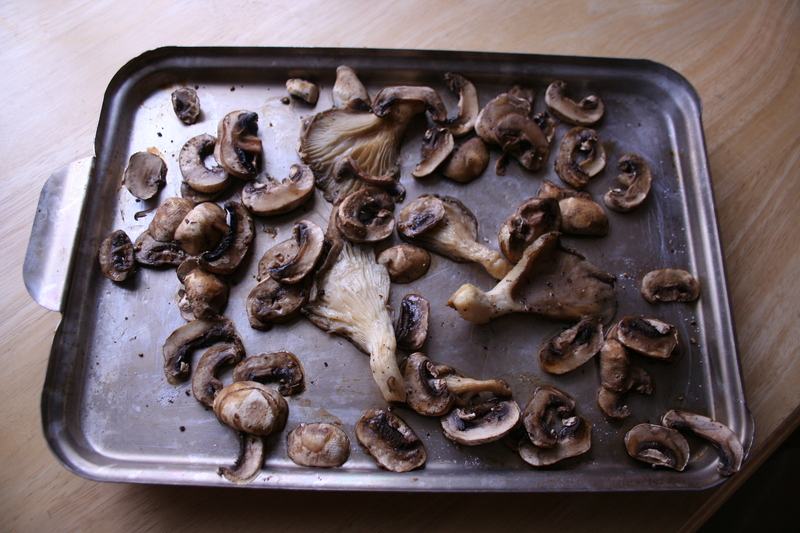 I started by slicing the mushrooms (I had both oyster and white in my hamper,) laying them on a baking sheet and drizzling them with olive oil and salt and pepper. I then tossed them into the oven to roast for about 20 minutes. All-in-all it turned out pretty tasty. The mushrooms added texture to the sauce and I was able to spice the tomato sauce so it almost didn’t taste like it had come directly from a can. Beyond the sauce, however, my meals so far have been pretty basic. Some fruit, tea and a meal replacement drink for breakfast (I’m not a big breaky eater to begin with.) Yesterday I had a mushroom, lettuce and carrot salad for lunch with some iced tea to drink, for dinner it was hotdogs and caesar salad. Today I had the pasta for lunch, and an orange and granola bar for an afternoon snack (I also tried one of the bubblegum puddings, but after a co-worker remarked that it looked like a dental treatment, I had to stop.) This evening it was beans and weiners for dinner. 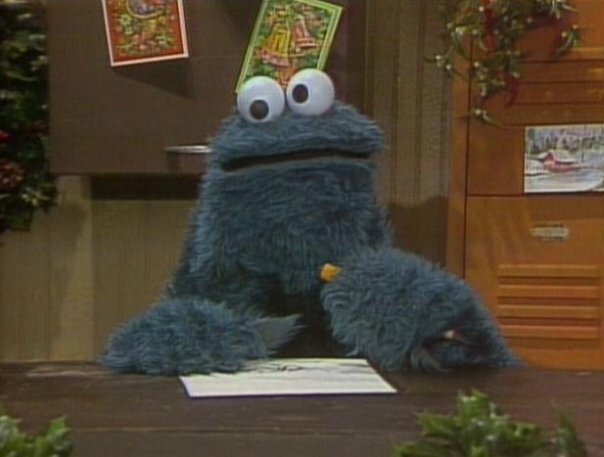 And cookies – well, I’ve been eating cookies because there’s just so many of them. I need to stop. I’m going to start growing blue fur and get all googley-eyed. I’m a little concerned about the days ahead, however, because I’m starting to get sick. It came on really quickly last night and today I’ve been sneezing and hacking and generally feeling lousy. I really wish I could take some Tylenol or cold and flu meds, but it’s off limits, so I’ve been downing water to help flush it out. Hopefully it’s a mild cold and will pass quickly. To be clear, though, I’m not saying it is the food I’m eating that is causing my health to deteriorate. I’ve been anticipating a spring cold for a couple months now and am surprised I didn’t get it sooner, although I am concerened that the next few days won’t exactly help me get over this. Usually I would take something to help me sleep really well and pound back o.j. and lots of vegetables. Tomorrow morning I’m going to re-evaluate what’s in my cupboard and see how I can pack the most vitamins into my meals. I’ve got a big jug of cranberry juice, which is high in vitamin C and it would also appear plantains are chock full of good stuff. I still have carrots and lettuce and apples, all which are great. Some soup might help to clear congestion and soothe my throat. Maybe I’ll lay off the cookies and hot dogs and other foods laden with preservatives – even for a day. 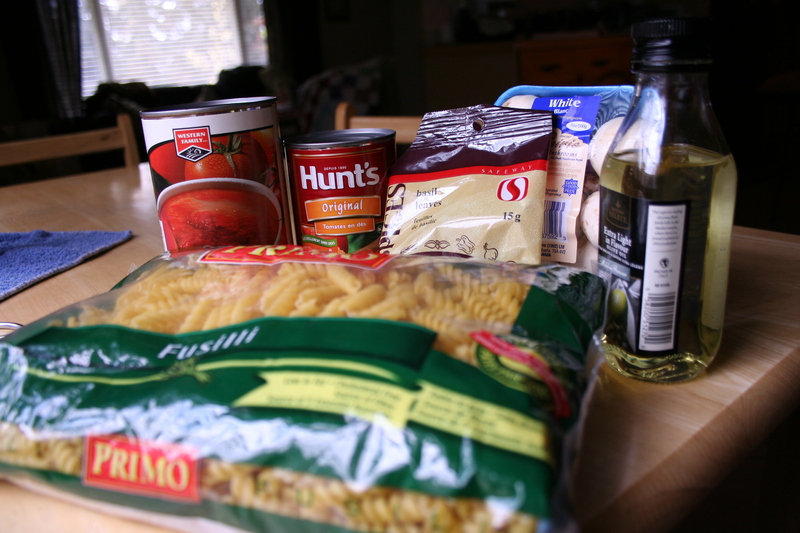 Hamper Day +2 Dinner – Darren and Jen	Uninspired. Humbled.